The police in El Cajon have released, and then updated, a press release about the shooting of Alfred Olango. Police have video of the incident taken from a bystander, which they say backs up their account, but refuse to release the full video. This is the still that we have to go on. We know that Olango did not have a gun or a Taser. The press release states the exact objects Olango had were a Smok TVF4 MINI attached to a Pioneer4You battery box. The device in total is 7″ by 2.25″ by 1″. For a comparison, a Glock 17 is about 8″ by 5.5″ by 1.2″. If the Smok was all silver as shown above, it wouldn’t resemble a gun from any distance, let alone the few feet as shown in the picture. Given that vape devices are commonplace, police should be expected to distinguish between smoking equipment, firearms, and Tasers. That’s an expectation that was not met here. Shooting was at 2:11, with weather in El Cajon being very hot and bright. So no “it was dark to hard to determine” defense like in the Fridoon Nehad case, where a non-weapon was misidentified also. As the still shows, police saw the device from multiple angles. Releasing the still seems to be a way of forming a narrative without backing it up in full. You would assume that this single frame, taken out of context, makes the police account look most likely. However, you don’t have to defend police conduct as it actually looked in real-time, nor any police methods used prior to the shooting. The police deflect why there was not a Psychiatric Emergency Response Team (PERT) personnel at this scene at the bottom of the updated press release. The El Cajon Police Department does have an agreement with Community Research Foundation / PERT which allows certified licensed clinicians to partner with police officers in the field in order to provide direct support for mental health calls. On 9/27/16, during the hours of this incident, there was a PERT clinician with a police officer. At the specific time of this incident, that team was on a different radio call that was also PERT related. They were not immediately available. (update: the Associated Press reports it took over an hour for police to respond and one minute to kill Olango. If it took that long, the “not immediately available” excuse doesn’t hold up. This was not a rush, in-the-moment job. This was a 5150 call, in which authorities come to take someone to involuntary psychiatric hold. Given that the call was about mental illness (not a call about crime or a possible criminal), having no special preparation is concerning. Though 5150s can be a good thing in the long run for patient health (I know many people who have had at least one called), this incident makes me less likely to call one in. As someone who provided information about mental illness to those who came into contact with people with mental health problems, or were otherwise difficult to help, I’m not surprised. The department likely trumpets this local relationship in promotional materials, yet when people’s lives are on the line, they are somehow unavailable. This is a similar issue we’ve seen so far with bodycams- often there, but unavailable or otherwise unaccessible. At this time, the officer with the electronic control device discharged his weapon. Simultaneously, the officer with the firearm discharged his weapon several times, striking the subject. Why, if the suspect is considered such that one officer has their Taser (rather than pistol) ready, would the two stages not be sequential. Non-lethal methods would not have worked in the death of Alfred Olango, because lethal means were used at the same time. Would Olango have survived if only the Taser been used? Much more likely. 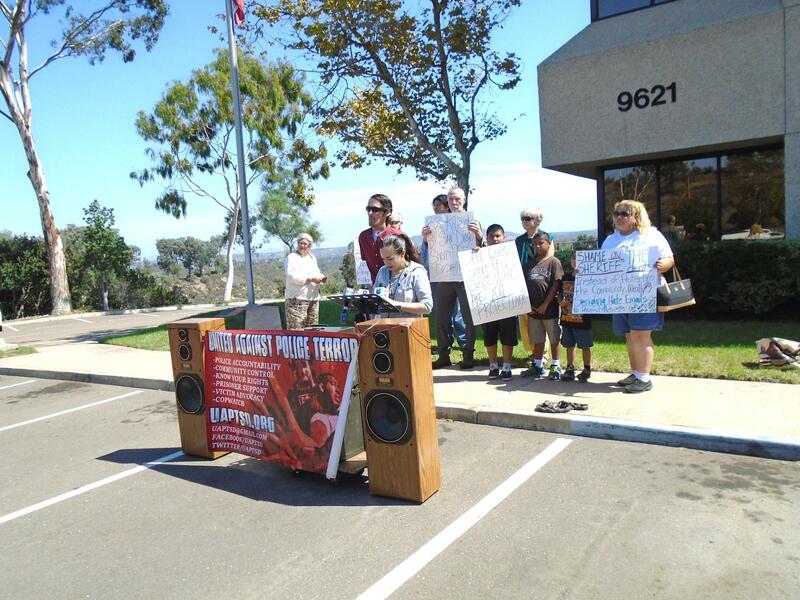 In conclusion, large protests in El Cajon have been held in the aftermath of Olango’s death. Given the official story as presented thus far, I find considerable issue with police conduct before the shooting, the misidentification of the object held by Olango, the use of lethal force before less-lethal means were tried, and the release of a single still image without context, so to prejudice the public. A good article by Thom Senzee about conflict within the San Diego Black Lives Matter movement. The original group had older leaders who wanted to focus on the “black” aspect solely, to the exclusion of other identities like LGBT+. Given that LGBT+ people are especially vulnerable to hate crimes, any good group needs to deal with the intersectionality of black and other identities or labels. It also reminds us that the black community has its own issues with intolerance, particularly given the large population of evangelical Christians. Homophobia and transphobia inside any Black Lives Matter local chapter is beyond ironic, according to Cat Mendonca (31) of San Diego. She points out that the movement itself was founded by three people who identify as queer women of color. Social media messages obtained by San Diego LGBT Weekly purportedly shared among leaders of the old, now-dissolved local Black Lives Matter San Diego chapter reveal that the group may indeed have been tainted by homophobia and transphobic sentiments from at least one leader. “The movement is supposed to be a safe space for all people regardless of their race, ethnicity, sexual orientation or gender,” says Mendonca. 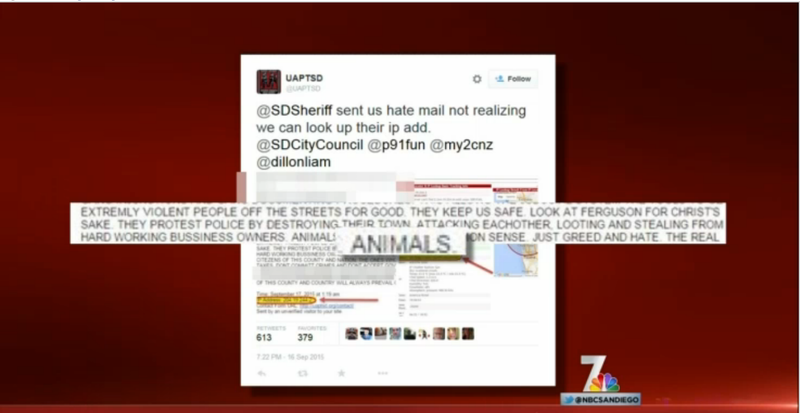 From NBC 7 San Diego newscast, 9/22/15. Shows excerpt of hate mail. 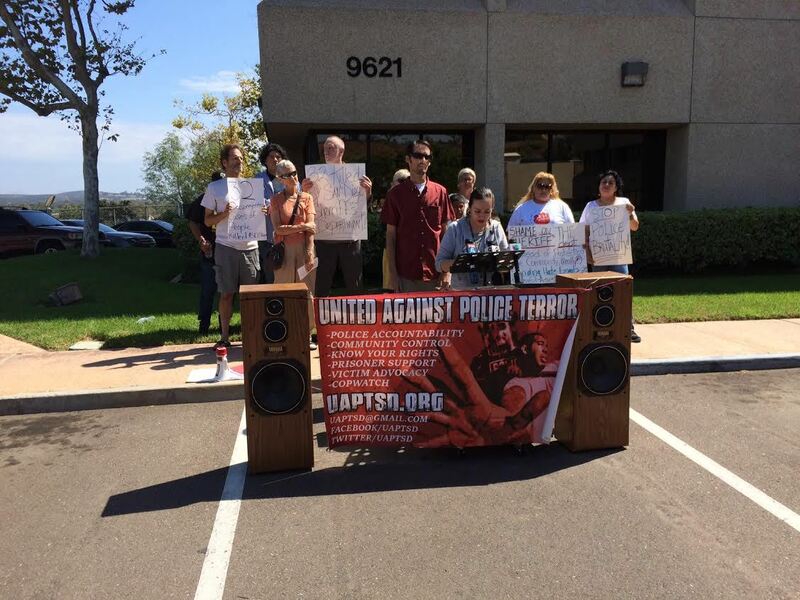 A press conference was held outside a San Diego County Sheriff’s Department administrative building this morning, concerning the September 16 hate mail received by police watchdog group United Against Police Terror. 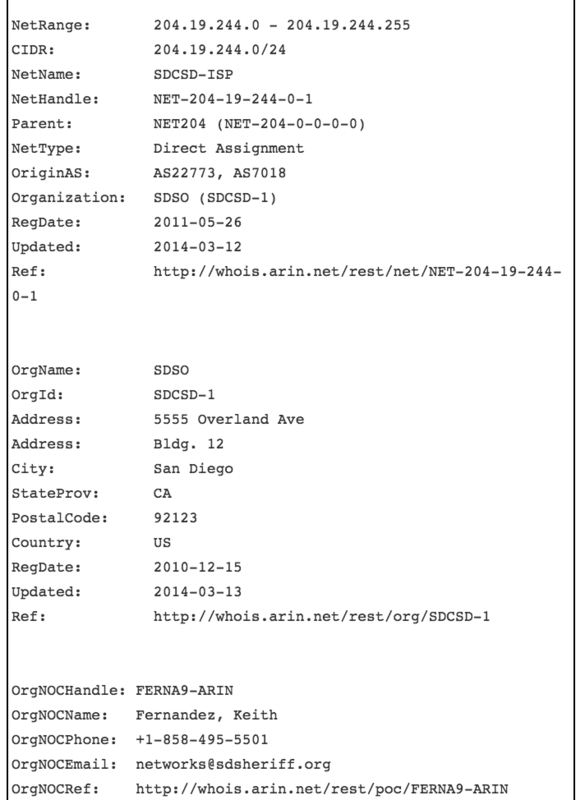 The unsigned email had an IP address that matched a Sheriff’s Department building in San Diego. Full info and commentary at an earlier post here. 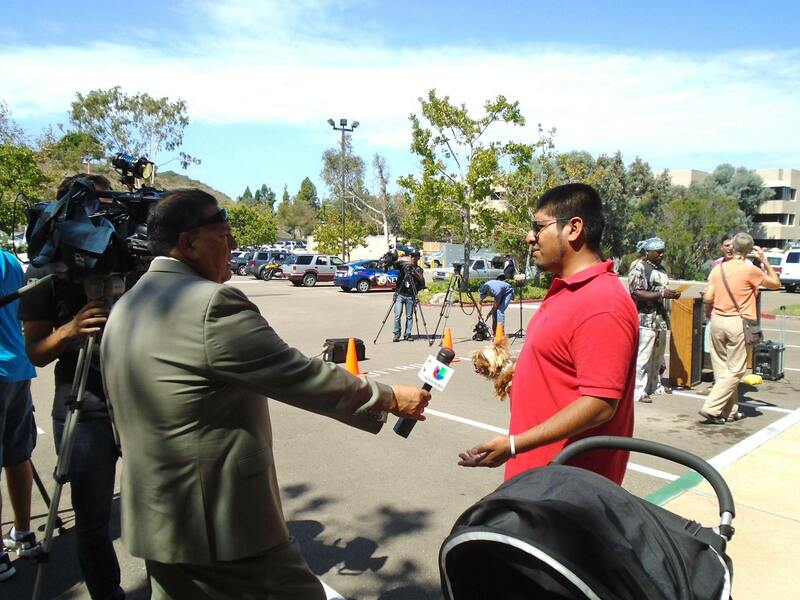 Five San Diego TV channels covered the rally, so check the local news tonight for coverage of an episode of appalling police behavior in San Diego. Threatening email sent to United Against Police Terror San Diego. The email is unsigned, and comes from the address “SISCKOKID1560@gmail.com”. It is clear that the individual believed their hate mail to be anonymous. However, email sent through the UAPTSD website contact page logs the IP address of the sender. Using a IP lookup service, the email seems to come from the San Diego County Sheriff’s Department- in particular the Communication Center located at 5555 Overland Ave, in Building 12. Full information about the IP address that sent the email. 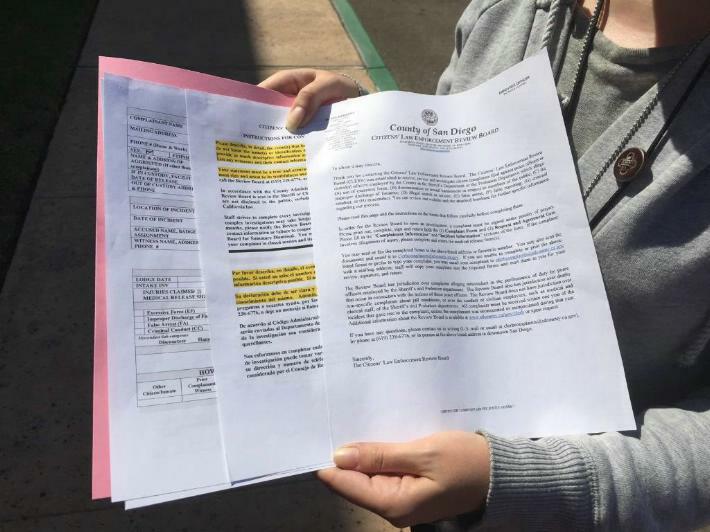 This is corroborated with the text of the email itself- the author uses “county” again and again rather than “city” or “state”, indicating an origin within county law enforcement. Hatred and juvenility from San Diego law enforcement organizations is nothing new. This email is the product of a culture rooted in racism and inability to tolerate dissent. When the author separates protestors from “real citezens [sic]”, it makes sense why San Diego police treat some people with dignity and others as lesser beings. This email also emerged from a facility paid for by residents of the county, reinforcing the activist claim that more police funding doesn’t lead to safer societies. It’s not just the weapons and technology that’s been militarized, it’s the wartime outlook that divides everyone into allies or enemies. The Guardian lists 174 unarmed people killed by police in the United States so far in 2015. That’s only the tip of a much larger system of violence, profiling, detention. 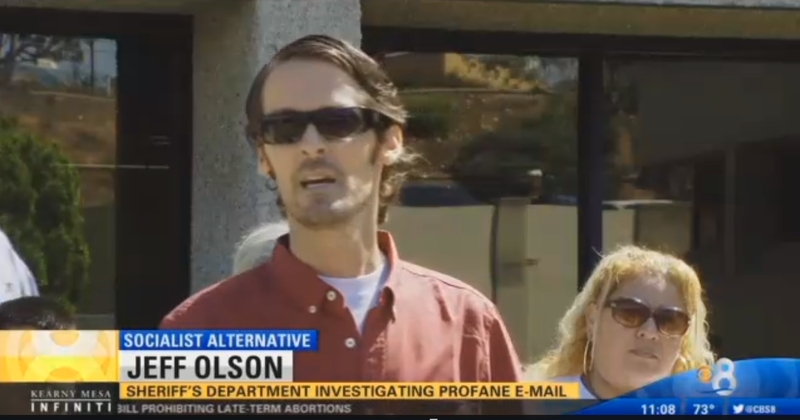 A county law enforcement official calling those that want justice “scum” is not one bad apple. These people emerge from a rotten system, with a thousand different symptoms. Using a police network to threaten activists is just one. There will be a press conference about this on Tuesday, September 22 at noon. Updates about the precise location and other info will be at the Facebook event page here.